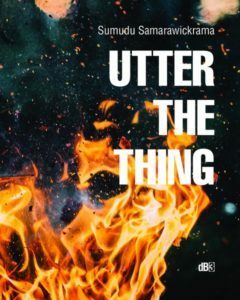 In Sentences from the Archive, as Webb explains in the afterword to this collection, these ongoing enquiries are considered through the Derridean concept of the archive. The archive has two aspects: it is an historical record of the where and when of events (its ‘sequential’ aspect), and it is a political authority that determines what can be culturally knowable (the ‘jussive’ aspect): “archive that shapes the future through the way it records the past.” (54) Each prose poem here is a punchy and insistent item in a sprawling archive. In fact the prose poems are somehow object-like in their density — the blocks of text, the sentences usually short and the flow dimpled, lines often blunt, matter-of-fact and brief in a bitter way (“Watch me fly” ). Objects are also a means of pinning down events in an otherwise bewildering flow of ongoingness: for the event of the death of a loved one, empty vessels like schedules, packing crates, and skips; for making a relationship comprehensible there are supermarket tomatoes, avocados, and cheese. Sentences from the Archive enacts an intense, repetitive struggle that occasionally resolves into apathy, guilt, or regret. Largely the opponent seems to be time. The fruit-softening domestic noir of poems like ‘Elegy III’, for instance: “The capsicum left too long in the fridge, the carrots left too long in the fridge, the potatoes that have grown eyes, the onions with their rotten cores, the love I never gave you.” (29) Time wins in the hopelessness of making rules, designing schedules which never seem executable and never permit you to keep up, be in charge, act decisively, as in the wonderful suite of poems ‘Waiting for the bus’: the bus “runs later each day, as though time were running out, as though time had lost its way.” (45) Time is a woman’s evening dress, powerfully attractive and disinterested in ‘What happened that night’. Time is the impending crisis, careless and inhuman in ‘Waiting for the phone to ring III’: “You know it’s on its way. You know it can’t be outrun. Keep your head down. Before the last chance reaches you, call me. I’ll find you if I can.” (13) Time is also the dominant figure of the ocean that is deep past and future, for the asylum seekers “our first home and our last,” (4) incomprehensibly sublime and complex, unnavigable, sometimes lover and sometimes cold aggressor. This allows for the endless dramatising of the loss of control: the ships are always drifting or else careening towards rocks, maps can never be followed. Here the sentence, the concept at the heart of this collection of prose poems, shows us what it is for. The sentence is a technical, rhythmic and aesthetic device, with a logic that shines through once it has been cracked in half (“If I had seized”); at the same time it is a judgement in a court of memory and history that delivers both moot and legally binding decisions: “If just once; then never again this.” It makes pronouncements for populations, and for personal histories, but these pronouncements repeatedly turn away from being definitive or predictive. The struggle to compose the sentence is the struggle to work with time and its substance, memory. In finding a means of expression that performs all these functions so sensuously, Webb has spoken back eloquently to her own questions about creative practice and the political, and to the questions she is prompted to ask by the figure of the archive. 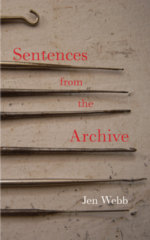 Sentences from the Archive is a dense, emotionally adventurous, and commendably experimental set of prose poems, with a vast network of intertextual references from the Biblical, to the ekphrastic, to the pop cultural (“if memory could speak it would say lock it in, Eddie, lock it in” ). Webb has developed her own form appropriate to the granular texture of time as we experience it, true to the shuttling resonance of memory and event, and awake to the entanglement of self with the world. ANNELISE ROBERTS lives in Melbourne and is a PhD student in creative writing at the Australian National University. Her work is about family, radiation, and the British nuclear testing at Emu Field, South Australia.